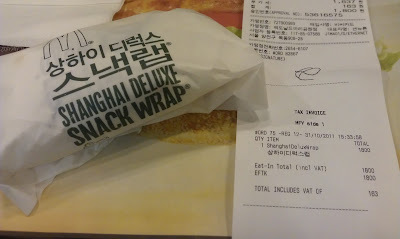 Special edition wrapper & receipt. 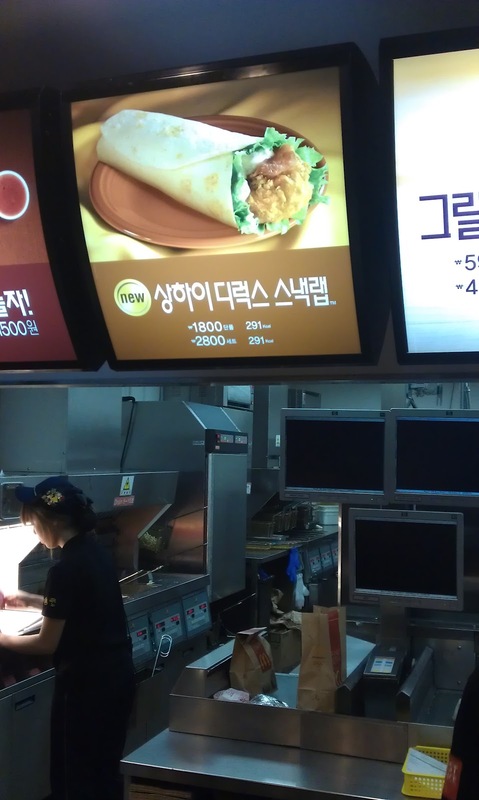 Note the lack of English on the signage - Welcome to Korea! Good afternoon from London! I'm off on my first ever business trip, and sorry about the lack of updates over the previous week, I've been pretty busy. I sampled a few of the Summer Limited edition items here but my USB cable is broken so I can't transfer the images from my phone to my camera right now, so expect those in a couple of days when I am back in Singapore...and no, I haven't been able to attend any Olympic events, the remaining tickets are a bit out of my price range. 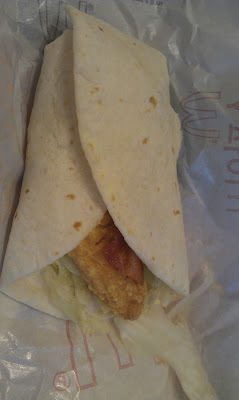 Though, one thing I would like to mention, is that the wrap on its own is 291kcal, but they also post the 'set' as 291kcal. Now I know the wrap sets do not include fries, but the standard drink served is regular Coke (and what you will be given if you do not specifically tell them what you want to drink), and seeing as Coke Zero (Korean McDonald's do not serve Diet Coke) is not something most Koreans drink, its a little cheeky to see them promote the set without the calories of the Coke. Though the regular set menus do not include these calories, in their images, they do specifically say that the set is calculated with Coke Zero, not regular coke.